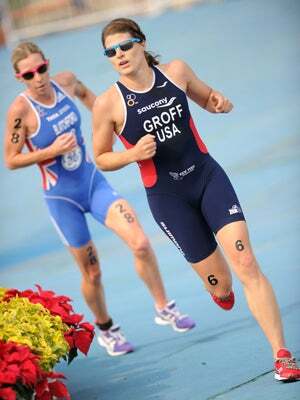 She's ran, biked, and swam her way to the Olympic Games, but what stands out about Sarah Groff is something else — this girl's got one hell of a personality. We chatted with the triathlete from her training camp in Switzerland, where she laughed her way through a conversation about the fancy jeans she never gets to wear anymore and her mandatory daily nap between training sessions. But, best of all, she even spilled the beans about a ton of stuff us spectators never knew went down in these athletes' world. We'll have to wait a little longer to see if Sarah will come back with a gold medal around her neck, but if there was an award for Miss Congeniality, she'd already have it packed in her duffel with the rest of those Team USA duds Sarah can't wait to get her hands on. Get ready to cheer this stellar lady on from afar, and until then, here's a few insider tidbits we picked up from the world-class athlete. Between competitors, there aren't many surprises — after all, they've been racing against each for a long time. "We compete against the same athletes multiple times throughout the year, and in some ways, those events are more competitive," she said. "We've raced against each other many, many times around the world, and raced each other even on that course. You develop relationships with your competitors, so I'm pretty friendly with anyone. It just comes down to managing my own nerves."
. "I get to represent my country and my sport at the highest level and be part of the biggest sporting event in the world. I won't ever have hundreds of thousands of people lining the course, have millions of people watching it on TV, and be part of a U.S. team that encompasses so many different sports. So, it's the same exact event basically, just with a smaller field of competition and a totally different focal perspective." Their lightest load of exercise all season happens while they're at the Olympics. "We joke about the fact that probably our easiest 'training day' is the day before an event, and yet, we're still doing at least an hour and a half of exercise, when most of the general population does [much less]. Sometimes, we lose perspective of how much training we do!" The best pre-race pump-up? Nothing at all. "I just try to have time to myself, you know. You wanna get a little bored right before an event because then you're just chomping at the bit, you can't wait to leave your hotel room and go race." Athletes get so much swag that they don't even need to pack clothes! "This is something that people never tell you, but when you go to the Olympics, you get a full new wardrobe. I only bring gear for training because they send us a document with everything we get from Nike and Ralph Lauren, and it's unreal!" Olympians get tickets to attend a few competitions — but it's not up to them which they get to see. "I'll have over a week [in London] of just taking it all in. Athletes get tickets to events and normally it's not the 'popular events,' as those are harder to come by," she says, laughing. "So, you end up getting access to different sporting events than you might normally watch, but whether it's table tennis or equestrian or [what have you], I'm gonna just try to see as much as I possibly can."